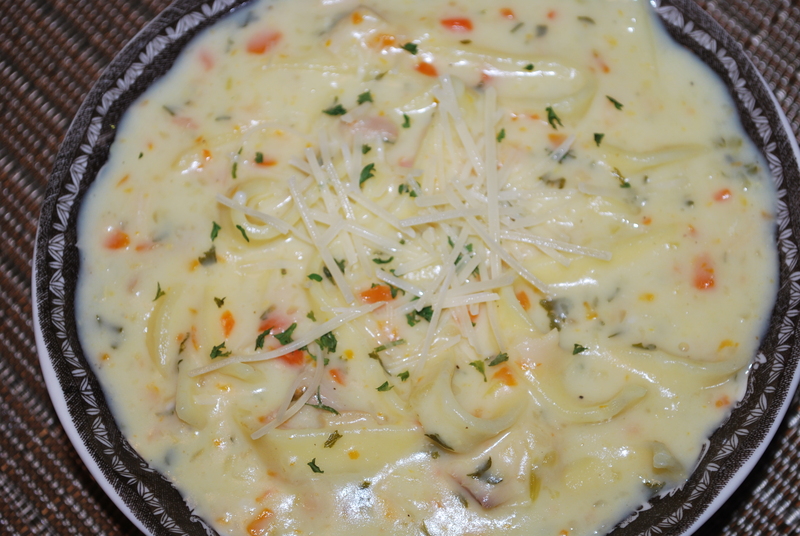 Creamy Chicken Noodle Soup – Live. Simple. Good. 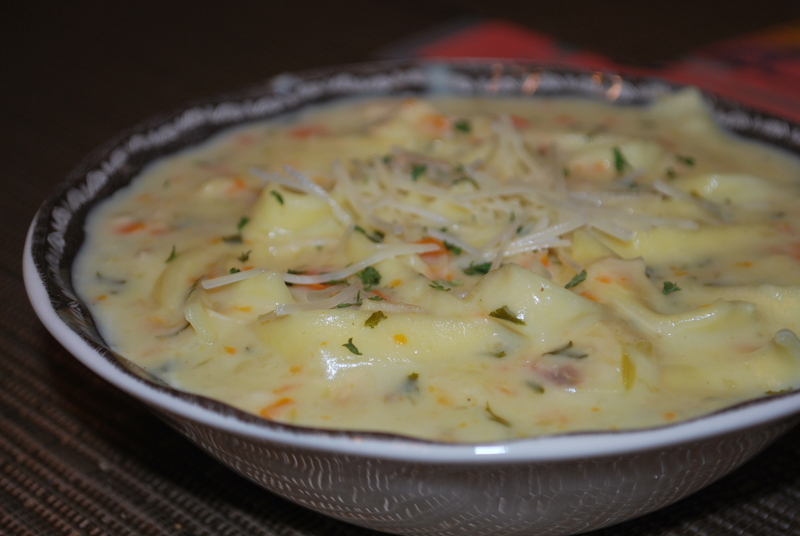 This Creamy Chicken Noodle Soup recipe from Cooking Classy is so good! The only other changes I made to the recipe were to use rotisserie chicken instead of chicken breasts and cooking the noodles in the soup – not separately. The noodles soaked up a lot of the broth so it wasn’t as diluted when I added the milk mixture – which means I had a really creamy and yummy soup for dinner! In a large pot, heat 1 1/2 Tbsp olive oil over medium heat. Add onion, carrot and celery and saute until tender, about 3 – 4 minutes, then add garlic and saute 1 minute longer. Add chicken broth, parsley, bay leaves and season with salt and pepper to taste. Add chicken breasts and bring soup to a boil over medium-high heat. Reduce heat to medium, cover with lid and allow soup to cook until chicken has cooked through, about 10 – 15 minutes longer (cook time will vary depending on thickness of chicken breasts). Remove chicken and allow to rest for 5 minutes, then shred into small bite size pieces. Melt butter in a medium saucepan over medium heat, add flour and cook, stirring constantly, 1 1/2 minutes. While whisking slowly add in milk and whisk vigorously to smooth lumps (it will take a lot of whisking to smooth since this is a lighter roux – lesser ratio of butter to flour). Whisk in cream and bring mixture to a boil, stirring constantly. 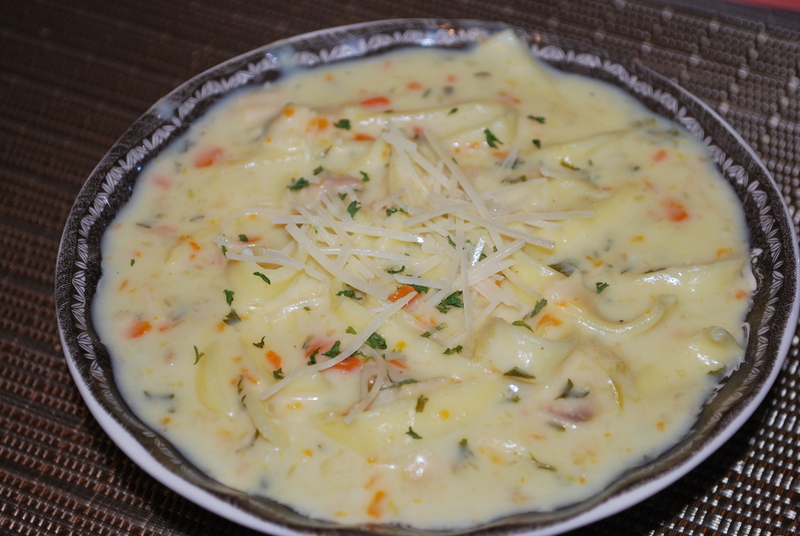 Pour milk mixture into soup mixture and return chicken to soup along with cooked noodles and stir. Serve warm with fresh bread or crackers if desired.